In Durham, CPR certification classes from the Red Cross are available in three ways: in-person, online, or via our blended Simulation Learning experience, which combines online coursework with an in-person skills session. This way, you can get the type of training that suits your learning style and your schedule best. After successfully completing any of our CPR classes you'll earn a two-year certification, and get access to online refresher materials that can help keep your skills sharp. Note: Although online-only participants can receive a two-year certification, only those who complete an in-person or Simulated Learning course can earn full, OSHA-compliant certification. In order to help you provide care during a crisis, the Red Cross offers CPR classes in Durham that can help you learn both CPR with mouth-to-mouth (rescue) breaths and hands-only CPR. This way, you'll be well versed in the ways in which CPR can be performed, and can offer help when it's needed most. At the Red Cross, we know that if you don't use the skills you learn in our Durham CPR training and classes, you're likely lose them or forget key points. That's why we've created step-by-step guides that you can print up and keep with you, no matter where you are. Our one-page instructions offer quick reminders on how to perform life-saving measures, which makes it easy to refresh your memory and maintain your skills. Whether your CPR certification is critical for your job or it's just for you, it's important to know that your credentials will expire two years from their award date. However, at the Red Cross in Durham, CPR certification is easy to maintain. We offer dozens of abbreviated recertification classes throughout the year so you can maintain your credentials and skills. Get CPR training in Durham that's designed specifically for healthcare professionals. Created for those with a duty to respond, our courses use the latest science and educational innovations to cover performing primary assessments, giving ventilations, choking, and AED use. Successful completion of the course gives you a two-year certification, access to free refresher materials and more. Instead of signing up several (or all) of your employees for off-site CPR classes in Durham, you can bring Red Cross trainers to you. This way, you can give your teams the CPR training they need, without arranging for, or paying for, each member to travel to a training site. 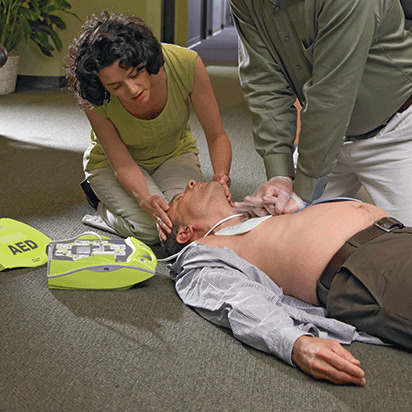 In-person classes like these include First Aid and AED usage, and take just a few short hours. Those who successfully complete the class will receive a two-year OSHA-compliant certification, which can help your organization meet its health and safety goals. In Durham CPR classes from the American Red Cross are delivered by experienced professionals with access to the latest science and educational materials. All of our courses are designed under the guidance of, and reviewed by, the Red Cross Scientific Advisory Council, which ensures that you receive the most accurate, up-to-date training available.